Built circa 1878, this is the oldest known remaining structure in Louisville. Charles & Amelia Niehoff’s son, Bert, went on to become a Major League baseball player. It is currently home to Louisville’s Parks & Recreation Dept. Louisville Farmer’s Market is Celebrating its 8th Season! 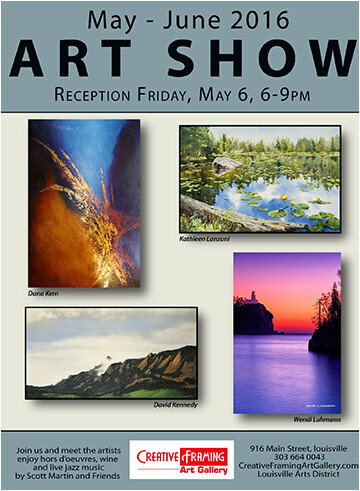 Featuring the works of Wendi Luhmann, Dana Kern, Kathleen Lanzoni and David Kennedy. Enjoy hors d-oeuvres, wine and live jazz by Scott Martin and Friends. Don’t let the orange-vested road crew and heavy machinery keep you away - for the month of May we’re offering BOGO watch batteries and 10% off any purchase or repair. We always clean and check your jewelry for no charge, so stop in any time Tuesday – Friday 10:00 am – 6:00 pm or Saturday 10:00 am – 4:30 pm. 950 Spruce Street, across the street from the library. Get ready for the Taste, one of Louisville’s best events of the year. Great food, live entertainment and loads of fun. Start the day off with the 12k, 5k and children runs. Register now at Louisvilletasterace.com. 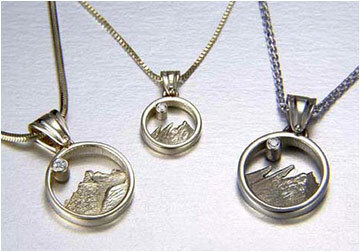 Don’t miss the uncommonly beautiful handmade jewelry by Taylor and Tessier of Aspen. From bracelets, earrings and necklaces, these pieces combine gemstones, leather, wire and coral and are inspired by nature, and the color and texture of the Rocky Mountains. Sisters in the House II with Gaile and MaryLynn Gillaspie and a cast of great musicians. The duo will perform duets and solos but this is a WAIT LIST ONLY show. Both shows are sold out. 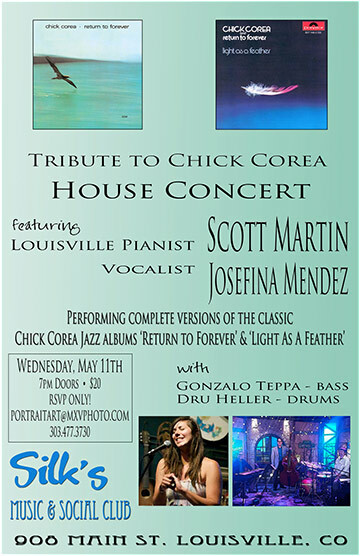 Scott Martin Trio and Josefina Mendez performing complete versions of the the classic Chick Corea jazz album “Return to Forever” and “Light as a Feather.” Scott Martin, piano, Gonzalo Teppa, bass, Dru Heller, drums, Josefina Mendez, vocals. SuperCollider with Devon Parker, vocals, Greg Tanner Harris, keyboards and vibes, Matt Fuller, guitar, Jon Gray, trumpet, Jon Stewart, sax, Ben Rubin, bass and Zack Littlefield drums. Check out this unique sound of improvisational jazz melding with blues, funk and rock. Looking for something special to do with your mom on Mother’s Day this year? 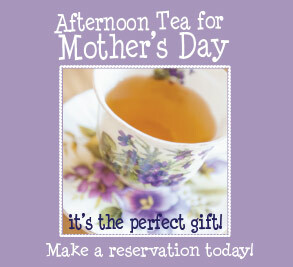 Make a reservation now for a special Mother’s Day afternoon Tea! 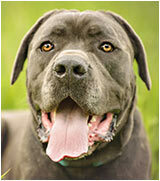 Call now (303) 666-8020. 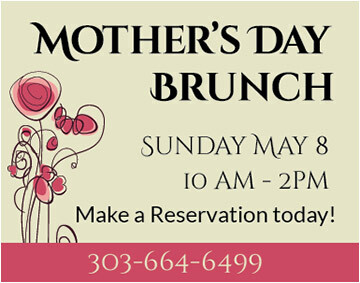 Take your mom out for our special brunch on Mother’s Day! Make your reservation now and call 303-664-6499. La Rev is celebrating its 4 year anniversary on Saturday, May 7 from 1:00 pm – 4:00 pm. They will have live music, outdoor bar and grill, face painting and balloon art for the kids, door prizes, and more. Be sure to drop by and enjoy the fiesta! This tiny house at 1425 Cannon, located in Louisville’s Little Italy neighborhood and built in about 1900, consisted of just 375 square feet before a small addition of 100 square feet was added to the side. It has since been further enlarged. It was the longtime home of Gaetano and Tessie Grotto. Today, the “tiny house” movement is leading many people to choose to live in smaller spaces, but in Louisville, the typical dwellings for many decades were tiny houses. In fact, many of the existing houses in Old Town were originally modest-sized houses that were later enlarged. Museum Coordinator Bridget Bacon will share images of some of Louisville’s original tiny houses and Historic Preservation Commission members will discuss landmarking in Louisville. Rob Sherman from College Insights will provide valuable insight into the PSAT, SAT and ACT tests. Rob will discuss how colleges use test results for admissions and how to decide which tests are necessary for different types of colleges. He will also reveal some important strategies and techniques for raising test scores. This is a must-see for teens and parents alike! Ryan Van Duzer is a local adventurer, journalist, and filmmaker who has documented his travels for Discovery Channel’s “Out of the Wild,” created a web series about trekking the Himalaya’s for National Geographic, and hosts videos for Travel Channel. He has also biked from Honduras to Colorado! Ryan will talk about carving out his own unique path in life and creating a dream career, share inspiring stories from every corner of this amazing planet, and motivate everyone to get up off their couches and see the world.